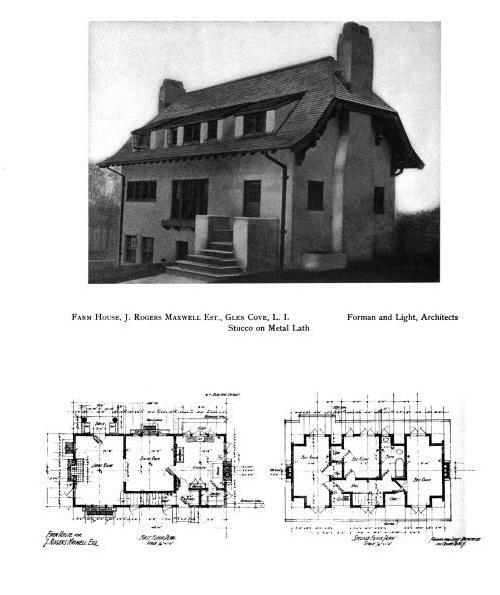 A farm house designed by Forman & Light for 'Maxwelton', the John Rogers Maxwell estate in Glen Cove. Click HERE to see where the farm house stands on google earth and click HERE for a current day picture. Click HERE for more on 'Maxwelton'. Zach: I'd love to see more photos of Maxwellton and the Whitney house next door. There's a wonderful NYTimes article on the properties when they were sold to a developer in the 1950's. I'll forward the link when I find it. When I was a child- early 1970's, one of the Whitney daughters still lived in a cottage on the property. She was very old and very eccentric and the place was falling to ruin around her- our own "Grey Gardens". My error in the previous post- it was a Maxwell daughter who remained. A nephew of hers was our neighbor and would periodically buy food and attempt to clean up her place- other relatives having long given up. Clearly, like Grey Gardens, there was a touch of mental illness, not just lackadaisical housekeeping. Magnus - this has been a conversation Zach and I have had over the Maxwell/Whitney properties. Did Whitney get land from Maxwell when he married his daughter and share the farm buildings? There is a photo of the Whitney place in the book Long Island Landscapes and the Women who Designed Them. There is a big equestrian place in Old Brookville on Pond hollow Road backing up to Cedar Brook Country Club. What's the story on that? HPHS- I know one of the Maxwells, although I'm not certain how conversant he is on family history. I'll ask though. Chip, I'm not entirely sure. Zach was kind to provide an early picture of the Pembroke gate for me. I had collected parts of a fallen finial years ago to reconstruct, but never saw a picture of what the handles looked like. The reconstructed urn is sitting in front of my house today. I didn't do a bad job on the handles! The Maxwell's are all about family. That is true today and true when Maxwelton was built. Rogers Maxwell expanded his property for a son and a daughter. The daughter married Howard Whitney, and the brother and sister maintained the property after Rogers Maxwell died in 1910. Howard Maxwell, the son, also owned farmland south of Red Spring Lane adjacent to Woolsey Avenue where he raised milk cows. Marnie Garfield, Howard Maxwell's daughter, lived in a cottage at the bottom of the water tower with her husband, Jim, grandson of President Garfield. I wouldn't suggest mental illness, as much as I would suggest financial difficulties.